It’s an exciting time right now for Asia, which is expanding so quickly that whole cities are being designed, and existing cities have to be redesigned to accommodate all of this new development! Guangzhou, China’s 3rd largest city, is now joining the ranks of these foward-looking cities, and is getting a revamp to allow for more growth and at the same time make it more livable and sustainable. Some of the upgrades include mixed-use amenities like parks, commercial space, and increased transportation facilities that will make the city more cohesive. San Francisco-based Heller Manus Architects is responsible for the master plan of this new Southern axis to the city, which will tie into the recently designed Northern axis, also designed by Heller Manus. The plans include waterfront, open space, increased density and transit corridors adding up to 3,652 acres of development. 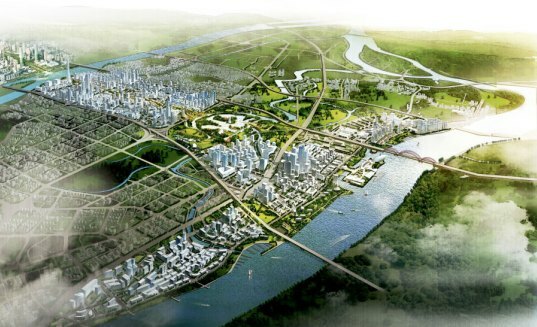 Once complete in 10 years, the North and South Axes will be combined to create a new urban center for Guangzhou. Green and open space will snake its way along streams and waterways out to the waterfront. Low density housing will be replaced with denser housing schemes, and government, civic, commercial and retail will also be added to create a truly mixed-use environment. Other amenities include schools, hospitals, entertainment venues, hotels, a TV tower, a sports park, an aquarium, a hotel and a ferry terminal. Heller Manus was chosen for the redesign due to their use of sustainable design features, focus on urban open space and preservation, and integration of traditional Lingnan culture. Taylor Manus, marketing coordinator at Heller Manus says, “Lingnan culture encourages the harmonious integration of nature with the city environment along with innovative garden design.” Following this philosophy, the building design concepts were organized buildings around landscaped courtyards. The expansion of the transportation system is a major feature of the redesign, including the development of a light rail system. From the TV tower in the north all the way to the riverfront in the south, transport nodes will be placed along the corridor for increased accessibility. Mixed-use neighborhoods and stations will be placed at these nodes. Hi, I am the one who living in the city which is far away from the description you mentioned above. Its traffic, one of reasons why I hate this city, is affecting my schedule and attendance everyday. Had you ever seen TWO HUNDRED PEOPLES in a bus stop and a bus will be fully filled with peoples when it approaches the 2nd station? Because of the bad traffic, I am planing to ride a bicycle to work so that I am well manage my time!!! It's an exciting time right now for Asia, which is expanding so quickly that whole cities are being designed, and existing cities have to be redesigned to accommodate all of this new development! 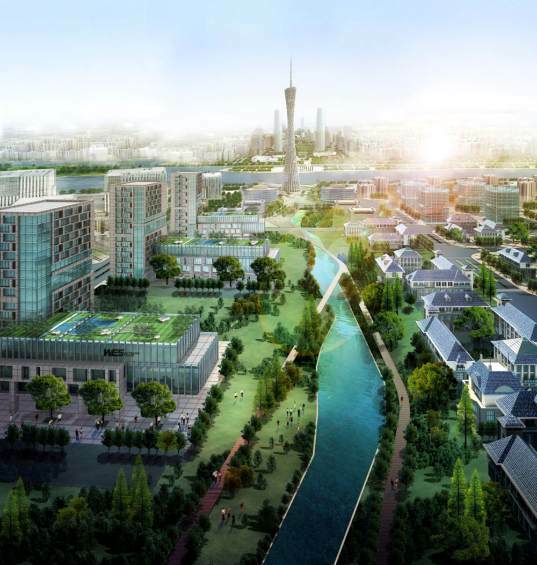 Guangzhou, China's 3rd largest city, is now joining the ranks of these foward-looking cities, and is getting a revamp to allow for more growth and at the same time make it more livable and sustainable. Some of the upgrades include mixed-use amenities like parks, commercial space, and increased transportation facilities that will make the city more cohesive. San Francisco-based Heller Manus Architects is responsible for the master plan of this new Southern axis to the city, which will tie into the recently designed Northern axis, also designed by Heller Manus.